Epigenetics represents a paradigm shift, as it suggests that a complex web of genetic and nongenetic factors are determinants of human development. A recent analysis by BCC Research reveals that large-scale investment in R&D, coupled with growing demand for epigenomic medicines across various application areas, characterize this vibrant market. There is currently a focus on epigenetic personalized medicine. Epigenetics is the study of heritable changes in gene expression that do not involve changes to the underlying DNA sequence. Personalized medicines are treatments that are tailored to individual patients, according to their specific needs. Epigenetic changes are the underlying causes for many chronic disorders. In particular, studies show that epigenetic mutations play huge roles in cancers. Epigenetic events are also potential drivers of acquired drug resistance in cancer treatment. The growing use of biomarkers for identifying discrete genes and proteins that can differentiate one type of cancer from another and enable the use of highly tailored therapies is expected to increase demand for personalized medicine for cancer treatment over BCC Research’s forecast period. 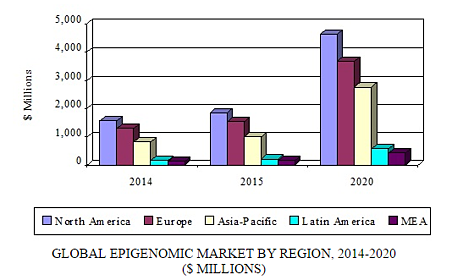 Overall, the global epigenomic market is estimated to reach nearly $12.1 billion in 2020, demonstrating a five-year compound annual growth rate (CAGR) of 20.6%. North America, which dominates the global market, is projected to reach $4.6 billion in 2020 with a five-year CAGR of 19.9%, thanks to highly developed technology and rapid advancement in cancer drug research. Asia-Pacific should experience the highest growth rate among regions due to rapid technological advancement and increasing demand for epigenomic drugs. Also, the region’s large population, coupled with growing infrastructure development, should drive growth. The market is expected to reach $2.8 billion in 2020 with a five-year CAGR of 22.8%. Epigenetic personalized medicine is being driven by numerous forces. Federal governments, private entities, and individuals are spending more on healthcare, which in turn is expected to boost the epigenomic market. Key growth factors include improved infrastructure in growing economies, more awareness among the public as well as healthcare practitioners, higher disposable incomes, and increasing medical reimbursement rates. Other market drivers include the following. Epigenetics deals with disorders that occur as a result of alterations in gene expression, which are caused by modifications in DNA without affecting its sequence. These include cancer, autoimmune, inflammatory, and other chronic diseases. DNA modifications also result in early aging, thus increasing the risk of age-related conditions such as diabetes and cardiovascular disorders. The increasing prevalence of cancer is one of the key factors contributing to the growth of the epigenetic market over BCC Research’s forecast period. Estimates published by the World Health Organization suggest that the global population older than 65 is expected to rise from 524 million in 2010 to nearly 1.5 billion in 2050, with most of the increase in developing countries. Growth in this population is expected to serve as a high-impact driver of the epigenomic market. Moreover, growing geriatric population bases in Asia-Pacific countries such as India, Japan, and China are expected to drive market growth during BCC Research’s forecast period. The most studied epigenetic changes include DNA methylation and histone modification. Many different enzymes, such as histone deacetylases and histone methyltransferases, modify histones. These enzymes have proven to be potent biomarkers for the research and development of epigenetic drugs. Considerable activity and interest is focused on the therapeutic segment of the epigenetic field. Many biotechnology, pharmaceutical, and academic research organizations are collaborating and, in turn, this is creating one of the biggest drivers for growth of the epigenetic market. Organizations such as the US National Institutes of Health, the National Cancer Institute (NCI), and the International Human Epigenome Consortium promote funding to support R&D pertaining to the epigenetics field. The growing need to understand various epigenetic modifications at a molecular level is expected to encourage these organizations to fund R&D programs. Endeavors (such as the Epidemiology and Genomics Research Program in the NCI’s Division of Cancer) that grant funding to encourage research initiatives pertaining to novel epigenetic research are expected to serve as a driver of this market. Market restraints include the following. The development of therapeutics for epigenetic-based disorders relies on the identification and validation of specific biomarkers. Many diagnostic companies face challenges in this area, which is proving to be one of the most critical hindrances in the development of the epigenetic market. Inappropriate R&D facilities and the extensive need for research is expected to restrain market growth during BCC Research’s forecast period. The regulatory framework for the approval process has always been a major restraining factor in the pharmaceutical, biotechnology, and medical technology industries. Novel epigenetic drugs must pass a stringent and time-consuming regulatory process before becoming approved. There are no clear regulatory guidelines for the diagnostic sector in developing countries such as India and China, where diagnostic markets have great potential to grow due to large patient bases. A lack of health insurance and trained manpower in remote areas are also key factors hindering growth of this market. North America is the dominant region as the result of good infrastructure, increased spending on healthcare, and a high rate of cancer cases. It is anticipated that the Asia-Pacific region will register the highest growth in coming years due to an increasing number of cancer cases, an improving healthcare infrastructure, larger investment in R&D by the government and private organizations, and more disposable income. Personalized Medicine and Epigenomics: Technologies and Global Markets analyzes the market by segments for emerging opportunities in biomarkers, diagnostics, and therapeutics. Detailed analyses of global market drivers and trends, with data from 2015 and projections of CAGRs through 2020, are provided.